Usually authors wait until they’ve finished their book to impart what they learned from the experience, but as the first full draft of my book ‘The #SocialFirefighter™’ takes shape, I thought I’d take a moment to reflect on the stories behind the story. As I write this blog, I’m sitting in Brisbane with a stellar view of the Story Bridge having clocked over 27,000km in the air this August in what can only be described as a book writing bender. But that’s not where the story behind my story starts. Over the past ten years I’ve been mainstreaming it in the Australian Public Service while building my own consultancy. The succession of once-in-a-lifetime or I-can’t-believe-I-did-that experiences I’ve had during those ten years – from writing Federal Ministerial speeches to conducting aircraft searches, stamping passports and zooming around an Army proving ground in a prototype protected mobility vehicle: have resulted in many “I should write a book about this!” moments. So in mid 2012 I decided to do just that, and the journey I’ve been on ever since has been just as ‘I-can’t-believe-that-just-happened’ as the content of the book itself. 1. Storyboard early and often. It’s changed several times since as I sequence and revise my content. I had to accept early on that change was part of this process and sometimes the feedback you receive or the ideas that spring to mind warrant another storyboarding session. Change is good as long as it’s evolving your content and you’re not stagnating within your narrative. 2. Find out where you write best: and replicate that environment as much as you can. Unlike most people, I find I concentrate best in a haze of distractions. Being surrounded by of a hive of activity allows me to tune out to tune in. At cruising altitude with Virgin Australia, Hawaiian Airlines and Etihad Airways. Sitting shoulder to shoulder amongst a platoon of US Army Rangers at the airport in Kailua-Kona, Hawaii. At the bar at South Melbourne’s Honey Bar. In the back of countless Uber’s and taxi’s. On the tour bus in the Korean Demilitarized Zone. On a beach in Phuket. On a Shinkasen (Bullet-Train) in Japan. At a Buddhist retreat on the Big Island in Hawaii. And in airport lounges from Honolulu to Seoul, Phuket, Kuala Lumpur, Singapore, Sydney, Adelaide, Brisbane, Canberra, Gold Coast and Melbourne. Learn to steal time to write – time you’d otherwise spend as a passenger or waiting around for an appointment can be great for intense short bursts of ideas, a few paragraphs, a mind-map or a chapter. Time stealing necessitates a certain degree of organisation – that is having your laptop or iPad handy: although I have written chunks of content on my iPhone and emailed it to myself when caught in a time delay situation unexpectedly. 3. Live and Write in the Moment. It’s really easy to dive into your laptop and forget about the world around you when you’ve hit a writing groove; but take a moment every now and then to look up from the screen and see what’s happening around you. Although you’re in a serious, committed, and long term relationship with your book – don’t isolate yourself in the process. Make time to catch up for coffee with your friends. Go out to dinner. Attend that event. There is always time to jot something down or write a paragraph outline on your iPhone. Having a life and writing a book shouldn’t be mutually exclusive endeavours! 4. Life WILL distract you: accept that your creative time and space will be hijacked … often. Life has thrown me some fairly major curve-balls in 2014. I stopped writing for a time because I needed the time and space to heal without putting pressure on myself to write for the sake of writing. Whether it’s work, home, relationships, family, pets … there is always something going on in life that will challenge you for time and attention. Accept it’s going to happen and when it does, it won’t fuss you. In fact, it makes you cherish the time you do get to write even more, which makes you more productive and focused. 5. Create content on the fly. 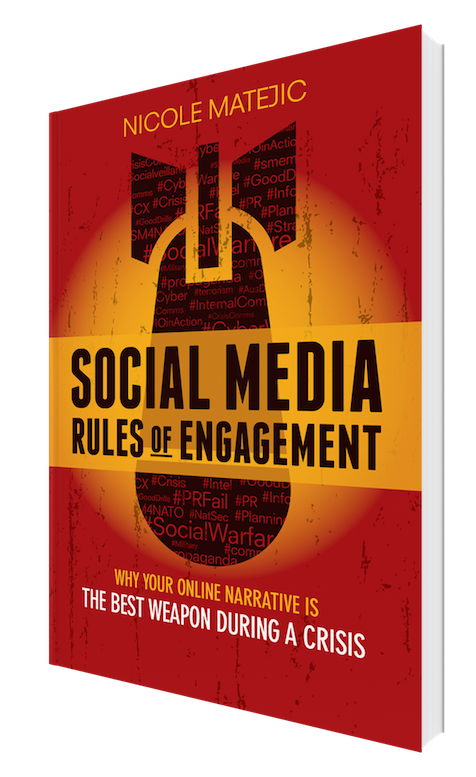 Use your social media channels as an expressive way to share your book writing adventures with your audience. In what could be the longest lead-in marketing campaign in history: I’ve been telling all and sundry about my book before for months! Why? Because it’s a story within a story. It engages your audience on a personal level and it enables you to think outside the text box in terms of content creation. For me, that means combining my passion for photography with updates on what I’m doing and where I’m writing. It’s uniquely you. It’s engaging and it raises your brand awareness and creates interest. If you’re like me and run multiple Twitter accounts you can also use RoundTeam to auto tweet your own (or other’s) hashtags to help you share your uniquely hashtaged content. I have a hard and fast rule in life – if you’re an ‘un-supporter’ you’ll soon find yourself my ‘un-friend’. It’s pretty simple: I value my time immensely. Not just because I’m writing a book – but because I have next to no tolerance for people with negative outlooks, mean dispositions or dramatics. Instead, I consciously choose to surround myself with genuinely nice people – kindred spirits – real people willing to have real and honest conversations about everything from life to politics to business to philosophy and more. There will be people who spin you all kinds of nonsense about your ability (or inability) to write a book – everyone seems to have an opinion on your book writing endeavours! My advice is to hit the delete button on the toxic connections that aren’t supporting you on your book writing journey: or any other aspect of your life for that matter! I use Dropbox to save all my book files. I also back these up in multiple places offline regularly – but having the latest version of what you’re working on available across multiple devices is an easy way to add to or revise your work on the fly. It also makes sharing your files with others easy. I use Google Apps for Business – to streamline my email and synch my calendars. The amount of time this saves me from an administrative viewpoint is huge – and that’s time I can then spend elsewhere. For Organisation, writing notes and drawing mind maps; I use the App’s – Paper, Evernote and Penultimate. For content creation and photography; I use – Pages, Google Snapseed and Vintique. For travel; SkyScanner and Trip Advisor are my go to Apps. 8. Support will come from the most surprising places. A person’s village of support represents a groundswell of people with whom you’re not just acquainted with but who know you well (or at least feel like they do), and who like, trust, and respect you. My village of support has evolved to revolve around the #HoneyFamily in Melbourne. And true to form; it’s a community that was built by Honey Bar owner Steve Vallas through cultivating social media relationships. 9. Invest in yourself: and protect that investment. What nourishes your soul? What keeps you happy in life? What brings you balance? If it’s as simple as getting a massage a month or going for a walk on the beach every weekend; make it happen. Schedule that regular date with yourself and don’t bump it for anything! Early on in my book writing journey I realised the importance of trademarking The #Socialfirefighter; and fortuitously due to Karan White being my 800th tweep, I had access to a wealth of legal resources and knowledge at hand through Australia’s leading social media law firm Pod Legal. Knowing the online legal landscape: from copyright to blogging within the law and social media specific law – getting the right advice is essential to ensure your time is spent writing rather than litigating! Like legal advice, having sound financial advice about not only the publishing side of your finished product – but also how to manage working/consulting and investing in yourself to give you time (which may otherwise be billable hours of work) is important to sort out in the early stages of planning to write your book. How much is your time worth? Will you need to lessen your client load or scale back your working hours to realistically give yourself time to write your book? Should you hire freelancers to pick up some of your load? These are the questions you need to ask yourself early on – as juggling work, play, life and book can have significant impacts on your earning (and spending) power. As adventures go, writing a book is certainly a ‘I-can’t-believe-I-did-that’ experience! One of the things you realise as you come closer to producing that first draft is that it’s rare that you get time in life to sit back and reflect on a decade past; to ponder life and the journey you’ve been on in such a unique way. And while this adventure is only about to get more interesting as I start to navigate through the editorial and publishing matrix; not to mention the actual publication and distribution of my book – I’m sure in a future update of this blog, I’ll have more stories from behind the story to share with you.